According to my Google search a Mardle is ‘To waste time in gossip’, although what this has to do with riding 100 km on a bike escapes me. The CCS contingent of Roger, Robin, Andrew, George, Mark and yours truly convened in the canteen at the University of East Anglia to discuss tactics for the ride and bemoan the fact there would be only one café stop on the route. On reflection perhaps this was our Mardle. We started our ride under a clear blue sky albeit a bit chilly. The route took us out of Norwich and onto the minor roads to Intwood, and Mulbarton onto the B1113 and B1134 to the information control at 25.8 km. It was along this section of the route we were tempted to stop at a farm advertising cakes for sale, however we all agreed our bodies were temples and would resist the temptation to stop. The route crossed the busy A140 and carried on the B1134 to the Pulhams, Starston, Harleston and on to the second control and Café stop at Halesworth, 61.2 km. The Bridge Street Café always provides a good selection of grub, my particular favorite being the date crumble which comes in man size portions. Following our refreshment stop we continued our ride through Rumburgh, Homersield, Alburgh and up Dove Hill, the only hill on what is a very flat route. The route then took us to Hempell, Saxlingham and Shotesham Mill, a picturesque ford with no bridge where it was necessary to ride over the wooden footway to avoid the fast moving water in the ford. At this point we managed to apprehend a kind gentleman to take a photograph of our group. By this stage our group had swollen to about 20 riders for the final section of the route through Swardeston, Colney and Colney lane to finish back at the start point at the UEA. 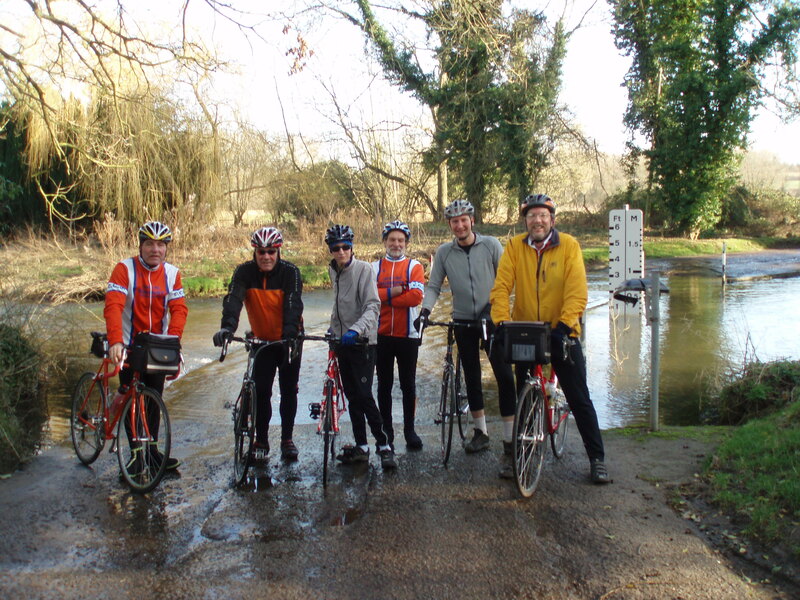 This was a very well run and supported event, ideal for our first Audax outing of the year. The mainly flat route was well designed to make use of minor roads, the weather was superb which all made for an excellent day out on the bike and a Mardle.